Eritrea: Arabian Military Presence in Eritrea - Will It Worry Ethiopia? 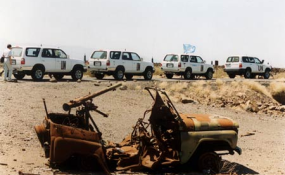 Remains of the two year war between Ethiopia and Eritrea at point 44 of the temporary security zone. The latest Horn dynamics ensued from the presence of Arab coalitions at the port of Assab, with the intention of fighting the Houthi rebels in Yemen, seems to have opened a window of opportunity for Asmara's regime to escape the UN Security Council's sanction which includes arms embargo. Mainly tasked with maintaining international peace and security, the UN body has imposed the stringent measure in 2009 as part of putting pressure on the regime to refrain from assisting the Al-Qaeda linked Al-Shabab militants. On the contrary, the Somalia and Eritrea Monitoring Group (SEMG) in its report on October 2016 reported that Eritrea forged "strategic military relationship with Saudi Arabia and the United Arab Emirates" which may undermine the outcome of the sanction. It also proved the construction of permanent military base at Asseb International Airport and a sea port adjacent to it. The SEMG, however, indicated that using the land, airspace, and territorial waters do not explain violation of sanction in itself. But, the Monitoring Group expressed worries on a direct and indirect compensation for the use, that may include benefiting the Eritrean Army, would constitute violation. As the port is close to the strait of Bab-el-Mandeb, a strategic neck between Red sea and Gulf of Aden, any country that wishes to secure its maritime trade or whatsoever may forge alliances with Eritrea, and this should not be worrisome to Ethiopia, Mogus T. Michael, Deputy Executive Director of Ethiopian Foreign Relations Strategic Studies Institute argues. "I do not think that we should be much concerned with what the Middle Eastern countries would or wouldn't do regarding Ethio-Eritrean issues. The point should be to find a solution that may help resume the interaction between the two countries," he adds. However, there is a looming problem in the region. Eritrea's engagement in destabilizing the region has not shown any sign of decline. It rather lies-in-wait until favorable situation unfolds, as it has recently been seen from Djibouti's accusation over Eritrea's troops' occupation of Dumeira mountain following the Qatari withdrawal from the area. Al Shabab's attacks on Somalia and Kenya continued while the regime trains, arms and equips groups that Ethiopia labeled as terrorists. Thus, Asmara's policy of Horn destabilization looks like to persist. Mentioning the increasing red sea militarization with the advent of non- African and African, Mekele University Peace and Conflict Studies Asst. Prof. Meressa Tsehaye firmly believes that Eritrea's adamant policy should carefully be dealt with for Issias is attempting to throw Ethiopia's national security in a complicated sphere of influence. In addition, the alliances are likely to complicate any possible effort of dealing with Eritrea." Be this as it may, the regime's internal and external problems look like to put it at a heartbeat away from its death, Meressa believes, and if this is to unfold soon, Eritrea's fate would either end up in the wrong hands or get into the woods, a succinct threat to Ethiopia's national security. Addis Ababa University African Human and Economic Development graduate students, Mussa Adem and Getachew Melaku also share their views on the topic. Mussa was unequivocal to argue that Ethiopia is big enough to play a constructive role both in Eritrea and the Gulf Cooperation Countries (GCC). For him, the GCC's presence is not a problem, but it is their possible assistance of various kinds to the regime. In this case, the political clique would resume flexing its muscle. "Thus, Ethiopia should devise another policy towards Eritrea that helps to ensure our security and economic interests." The existing Ethiopian policy towards Eritrea does not completely slam doors for peaceful relations with the country. It states that the two countries can enter into an era of cooperation, the former to get sea access and the latter to get electricity and market for its products, provided changes in Eritrea's regime or its policies. But, what is at stake is both seem far- fetched goals. Thus, the policy change seems timely. Mogos also upholds the proposal. He says Ethiopia should clearly understand the prevailing Horn dynamics and devise another policy that would invite Eritrea to come to negotiation table. If the status quo is maintained, obviously, Eritrea would continue twisting any event available to its advantages, whether it affects individual countries in the Horn or not. Meressa also sees the importance of a new policy but never sees any docile nature of the Issias regime. The regime has long failed to decide its own fate, and has no time to succumb to peace deals. He backs his argument mentioning the shaky foreign relations Eritrea long pursues. The fair weather friend had been a close ally of Iran and Qatar, but now taking sides with Saudi and its alliances. "So, the policy needs to consider the adamant character of the regime." Though the Ethiopian government hinted a possible policy change towards Eritrea, details are yet to come. Besides, any development in the Horn is linked with Ethiopia's import-export trade directly or indirectly. "A country which is home to over 90 million people can't afford to see any unholy Horn relations with others," argues Getachew, suggesting that countries creating alliances with Eritrea should make sure whether their relationship is against the interest of Ethiopia or not. Mogos also hopes that separate relationships of Ethiopia with the GCC countries cannot come to stalemate. "I haven't seen any motive from the GCC or Arab league to get into conflict with Ethiopia, diplomatic relations with the countries is by and large normal." The bigger opportunity to Ethiopia is to tap its ever maturing relations with the Arabian countries to put pressures on Eritrea besides the policy option. The agriculture, investment and market potential of Ethiopia are important elements in their relations, apart from the historical, religious and cultural similarities. Equally, peace in the Horn is no less important to the international community. Almost all the maritime trade of Europe and Asia, worth well over 700 billion USD [Center for International Maritime Security, 2016], passes through the narrowest strait. Thus side by side with Ethiopia's promised policy changes, the UN, AU and IGAD should take the matter more seriously than ever before. Copyright © 2017 The Ethiopian Herald. All rights reserved. Distributed by AllAfrica Global Media (allAfrica.com). To contact the copyright holder directly for corrections — or for permission to republish or make other authorized use of this material, click here.